Few motor racing legends are as recognizable and influential as Carroll Shelby. Both on and off the track, Shelby led a life that revolutionized the automotive world. We all know him for his 24 Hours of LeMans win, development of the AC Cobra, and the Shelby nameplate on the Mustang–but his private life is just as interesting. Although many books have been written about Shelby over the years, few have taken such a unique approach as Carroll Shelby: A Collection of My Favorite Racing Photos. Using images instead of text to tell his story, this photographic scrapbook was the final work of Shelby before his death in 2012. Art Evans put the final work into publishing Shelby’s personally-selected collection of photos. 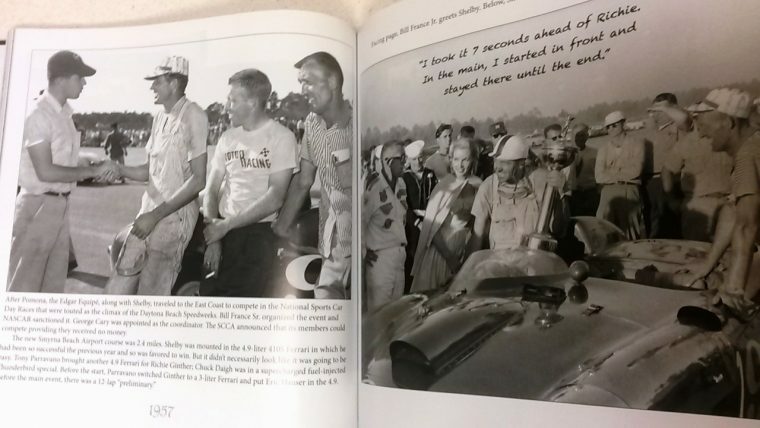 You’d think that a book about Carroll Shelby would focus primarily on his unrivaled racing and automotive legacy, but were Shelby himself to tell you about his life, he’d know much more than even his most devout fans would–and that’s what makes Carroll Shelby: A Collection of My Favorite Racing Photos such an intimate portrait of the man. With his racing rival-turned-best friend Art Evans, Shelby combed numerous libraries of photographs to select his favorite images and share them with the public. Bringing his journey from WWII fighter to national champion to life, this book chronicles Shelby’s world–and the golden age of motor racing. Each page shares one or two pictures from throughout his life and career. Most are candids of Shelby with his friends and action shots of him barreling town the track, but you’ll also see Phil Hill, Dan Gurney, A.J. Foyt, and more between the covers. Each chapter (22 in total) focuses on a specific year and offers 15-20 black-and-white stills capturing what life was like for Shelby at the time. Each image is accompanied by Art Evans’ detailed captions identifying it, with Shelby’s personal thoughts and commentary sprinkled throughout in italics. 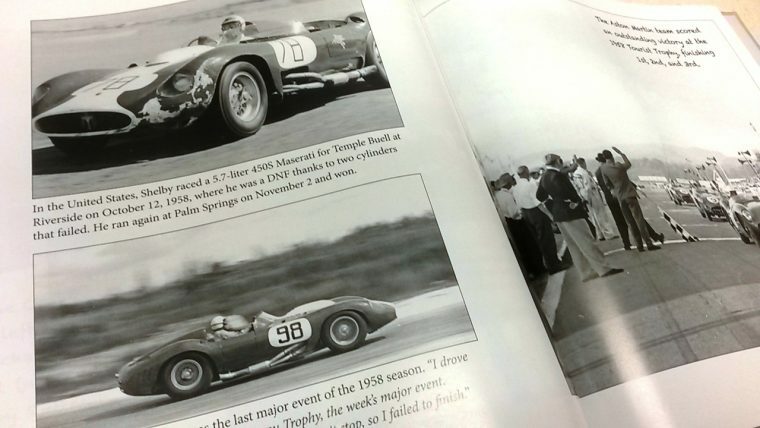 Carroll Shelby: A Collection of My Favorite Racing Photos needed to be a high-quality, finely compiled tome in order to preserve the careful work and uncommon insight this book bestows on readers now and for the future–and CarTech did a fine job making this book a sturdy, attractive piece. The “family scrapbook album” look of the cover and pages inside enhance the feeling that you’re browsing a private collection of photos. The choice to print this in 9-inch by 9-inch also support this. I particularly appreciate the decision to print each page in black-and-white instead of a vibrant or pastel color; that way, the visual emphasis is on the pictures rather than the design of the page. Too many photo books “spruce” up the page by injecting it with distracting colors and pizzazz that do a disservice to the pictures themselves. In this case, the simple, straightforward presentation of the photos and captions is exactly what it should be. There isn’t much to be said about Carroll Shelby that hasn’t already been said–but as this book proves, there’s a lot that can be shown. 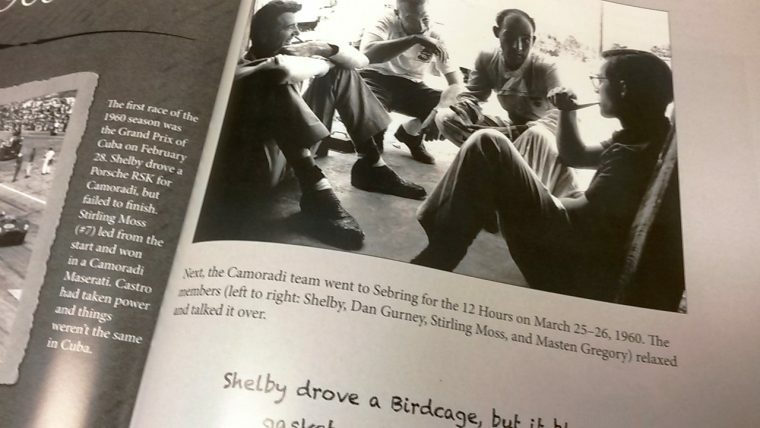 Far more interesting and engaging to read than most auto-biographies, Shelby gives us an intimate glimpse into his life in Carroll Shelby: A Collection of My Favorite Racing Photos. The visual approach reveals far more than a deluge of words would. While not every single photograph receives commentary from Shelby–which I wish did–Art Evans does an excellent job weaving quotes into the captions to enhance the context of many images. The pictures from Shelby’s early life are particularly interesting, and I’m glad that the majority of the book wasn’t a portfolio of his automotive creations–we already have plenty of those books. 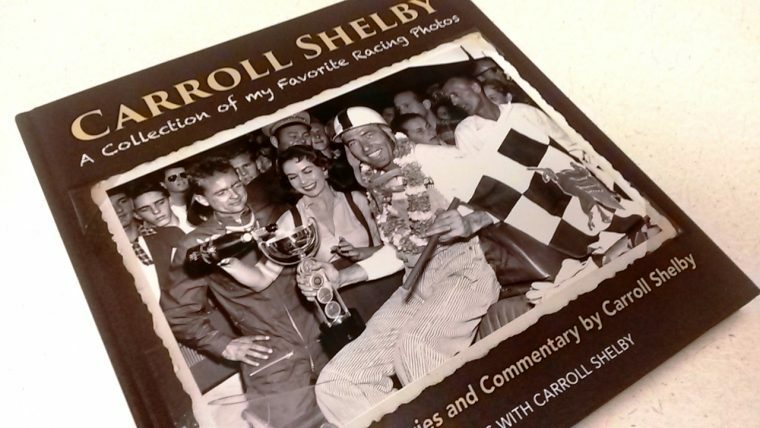 If you want an insightful look into a racing legend through the eyes of the man himself, I highly recommend picking up Carroll Shelby: A Collection of My Favorite Racing Photos. It’s an excellent opportunity to learn even more about the man in a uniquely personal way. Carroll Shelby: A Collection of My Favorite Racing Photos is available through the publisher’s website, Amazon, Barnes and Noble, Target, and other retailers. Product provided for review by publisher.